WWE Using Ronda Rousey To Make Stephanie McMahon A Bigger Star Outside Of Pro Wrestling? It looks like WWE may be using Ronda Rousey to help make Stephanie McMahon a bigger star, according to Dave Meltzer of The Wrestling Observer Newsletter. 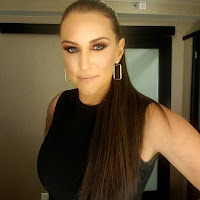 It was noted that one of the more significant reasons WWE hired Rousey was to help boost Stephanie's mainstream status and that the questions surrounding her financial value to the company are secondary. Boosting Stephanie's image is why they want the super high-profile match at WrestleMania 34 for Rousey, rumored to be Stephanie and Triple H vs. Rousey and an unknown male star, rumored to be The Rock or WWE Hall of Famer Kurt Angle. It was noted that while Stephanie is a big name in wrestling, she's not a mainstream star. One of the keys in bringing Rousey in goes back to what made Vince McMahon a star - the program with WWE Hall of Famer Steve Austin, and what made Austin a big mainstream star - the feud with Mike Tyson. While it was believed that Rousey's Royal Rumble handshake with Stephanie was to squash their beef, the idea for their feud is to make Stephanie a star outside of the pro wrestling world.